Our new favorite resource for creative ideas is Pinterest.com. Whether you’re planning a holiday party, a wedding or a kitchen renovation, it makes browsing the Internet for ideas much easier and a lot more fun. Instead of bookmarking, or worse, printing the ideas you love, you can ‘pin’ them to virtual bulletin boards on Pinterest.com. You can organize ideas by event, style, theme, or project, quickly go back to the source pages for recipes or how-tos, and even share all your ideas with friends. This makes it super easy to plan a party! To show you how fun it is, we created a Pinboard to help us plan a holiday party using our Sketched Pinecones Holiday Party Invitations for inspiration. First we logged in to our Pinterest account and searched for “pinecone holiday décor” to find decorating ideas other people might have pinned. We re-pinned any images we liked, adding them to our Pinecone Party Pinboard. Adding the “Pin It” tool to our toolbar allowed us to widen our search beyond Pinterest.com and pin images wherever we found them, crediting our sources and linking back to the details as we went. 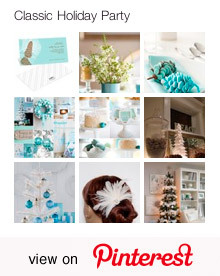 Quickly the theme began to come together, incorporating the cool aqua color, white feathers and pinecones in different ways. We found lots of DIY decorating ideas we loved, then searched for winter party food and beverage ideas, and pinned those, too. Now that we have our party all planned, we can share the link with friends. If you have an account, you can follow our Pinboards at pinterest.com/peartreegrtngs and make comments, as well as create your own boards. If you like it, pin it. It’s that easy!